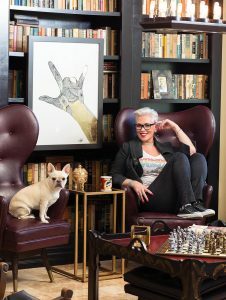 Kelli Ellis brandishes a paint roller with ease, is adept with a hot glue gun, and can turn those odd household spaces—the ones you never know how to decorate—into eye‑catching vignettes. She can tell you how to de-clutter your closet, create stylish storage strategies, and get the most from color, lighting, and texture. The Orange County interior designer’s name might be familiar to fans of TV home improvement shows, but they likely won’t recognize her as the one who appeared on multiple episodes of TLC’s “Clean Sweep” and HGTV’s “Takeover My Makeover.” That’s because the woman who excels at makeovers gave herself one about a year ago. “I had my hair cut off and buzzed and bleached. It was out of necessity,” Ellis says. Running her fingers through her platinum locks, she says, “I have been graying since high school. My (light brown) hair required a lot of care. At one point, I had to dye it every 10 days. At 46, she has found a comfort zone in a high-profile professional life. And now she has a signature look to go with her expanding brand. We’re seated in the entry library of her stunning 4,000-square foot Dove Canyon home in Rancho Santa Margarita. Ellis’s second husband, fitness and self-improvement entrepreneur John Spencer Ellis, owned it before they married. “I pretty much changed every inch,” she quips. The aquariums for her koi fish are here—she calls them her “water babies.” Canyon living comes with coyotes, so she doesn’t want to risk putting them outside. She exudes the same personal warmth she has on TV. She’s a hugger, so I’m given one on arrival. She’s been balancing myriad commitments recently, including residential assignments in Orange, Los Angeles, and Ventura counties; pro bono work on subsidized housing for families with sick children, called Miracle Manor, in Orange; and impending appearances at the Las Vegas Market. And she’s at work on a new series, “Design Therapy,” launching this month on the online Design Network. Kelli Ellis Interiors was born, and the Kelli Ellis branding began. Ellis believes there’s connectivity between events in our lives. As a child she created elaborate handmade houses for her Barbie, complete with wallpaper and tiny magazines to go atop the miniature tables. During family outings to the Ice Capades, she was more interested in the design of the shows than the skaters. She loved touring open houses with her mother, and assisted family friends in decorating their homes. Yet, she got her undergraduate degree in communications from California State University, Fullerton, and spent a year and a half at Western State College of Law before realizing she’d made a mistake and dropping out. She and her first husband started a family (they have two daughters: Alexa, 20, and Sophia, 21). Eventually, she enrolled in the Interior Design Institute in Newport Beach. 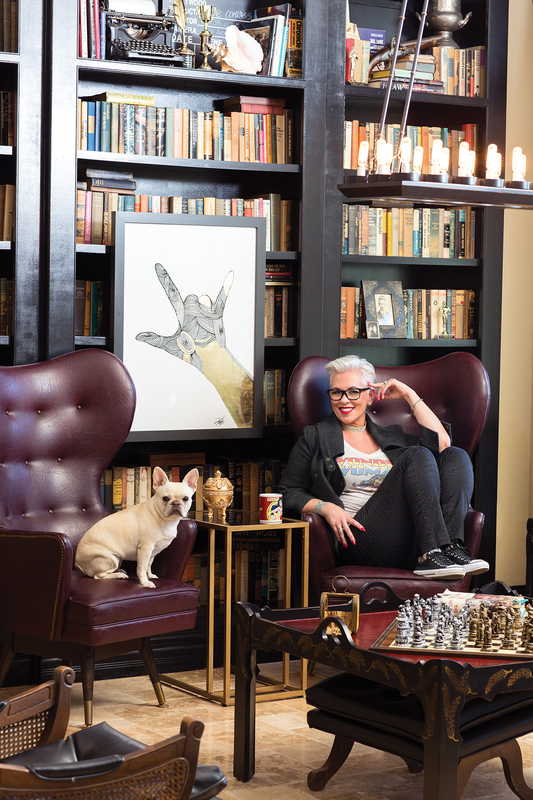 After earning a professional certification, she opened her firm in San Juan Capistrano. The show was “Clean Sweep,” which began airing on TLC in 2003. The simple scenario found her teamed with an organizer and carpenter to transform two cluttered rooms in two days for $2,000. “That was my learning by fire,” she says. “We shot two episodes a week, so I was up in L.A. four to five days a week. “Clean Sweep” was Ellis’s breakthrough. Multiple TV jobs followed, without her having to get an agent. These days, when she isn’t taking charge of an in-person assignment, she’s on Twitter, Instagram, and Facebook. Or she’s posting videos to eHow, where she’s a resident interior designer. Some of the rooms and spaces featured in her posts—and on her website—are from her home. Those antique books in custom-made bookcases in the library? They belonged to her great-grandfather and include a collection of 1,000 first-edition works of fiction. Additional bookcases are in her home office and in an upstairs alcove, where she has recorded some of her podcasts. Ellis’s business is interconnected with husband John, the CEO of the National Exercise & Sports Trainers Association. Kelli is one of the coaches for his eponymous online Spencer Institute for life coaching. “Marketing runs through this household,” she says. The Ellises, along with their French bulldog, Lily, go back and forth between O.C. and Las Vegas, where they both have business. They own a condo on the 21st floor of The Martin, which is across from trendy CityCenter. Its interior is featured on her website. Married since 2010, the two grew up within a mile of each other in Garden Grove (he went to Garden Grove High; she was at Anaheim’s Cornelia Connelly catholic high school for girls), but met as adults through a mutual friend. She didn’t even have to change her monogram; her first husband’s last name was Ellis, too. As a designer, Ellis tends to be pragmatic. “Come on. Do you really want to spend $30,000 to remove a staircase?” But she also advises clients to go with what they love. While taping Bravo’s “The Real Housewives of Orange County,” she made former Playmate Jeana Keough remove a painting of a moose from the living room of her Coto de Caza house. “This is not a lodge,” Ellis told her. Other times, she opts to “make the problem pretty,” as she did with the home of actor Lorenzo Lamas, which she took on for HGTV’s “Celebrity Holiday Homes.” Eyeing a giant pool table topped with purple felt, Kelli told the TV cameras, “There’s an 800-pound gorilla in the middle of the room. I could embrace it or I could ignore it.” She went with the former, filling the surface with festive decorations adorned for the holiday, including a votive-laden candelabra made from a motorcycle handlebar—a nod to Lamas’ biker reputation. “I know every inch of every freeway,” says Ellis, who navigates her white 2013 Porsche Panamera to clients in Fullerton, West Hollywood, Glendora, Encino, and Agoura Hills. The project will be detailed on Ellis’s new series, “Design Therapy.” And, we’re willing to bet, almost everywhere else.